Marketing experts weigh in on their tips and tricks for creating an engaging email newsletter. They also provide insight into the frequency of sending and formatting that work at creating engagement and community. If you have been following along with us, you may know that we are planning on rebooting our newsletter. Because of this, we have turned to a few friends to gain insight on creating a compelling and engaging email blast and newsletter. Lucky for us, we had quite a few marketing experts provide us with how they have created community and engagement with their newsletter. We survey 44 marketers for this survey. The survey consisted of 6 fill-in the blank, and 2 short answer response questions. Because we received so much good information from the short answer questions, we have split out findings into two articles. So don’t forget to read our article on creating a compelling newsletter too. When asked the size of the newsletter being sent, the number of subscribers played a big role in the frequency of sending. Those who are sending newsletters weekly had, on average, roughly twice the number of subscribers (54,000) than those that send less than weekly (27,000). 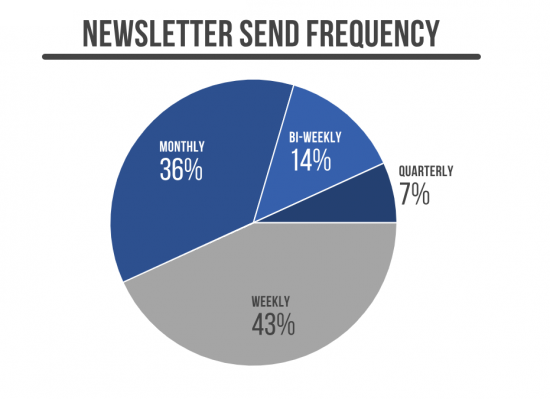 Weekly newsletters not only had more subscribers but were the most common response on send frequency from respondents. And quarterly emails were far below others in send frequency. Just 7% of respondents claimed they send newsletters on a quarterly basis. Takeaway: Subscribers expect weekly emails from large and established mailing lists. Upping your frequency is a great way to be taken more seriously as you grow your list. Today’s newsletter readers expect more than some text and a sign-off. From our respondents, we learned that there is a strong correlation between the variety of content formats used and mailing list size. In fact, newsletters that use two or three content formats have, on average, 2.2x as many subscribers as those that use only one or two content formats. Takeaway: Images and Infographics, curated links, and links to blog content add interactivity and variety to your newsletter. Adding more variety to your newsletter is a great way to make your newsletter more professional and appealing to a larger audience. In the first article, we wrote on tips for creating a compelling newsletter. This article will cover tips and tricks for creating engagement and community with an email newsletter. What we have learned is that to create a great newsletter, you have to create engagement and customer relationships to start with. Though many of us want to write about our brand and products, you have to make it worth-while to readers. Therefore, you have to give the subscribers what they want and disguise your message to fit within that content. Here’s more on everything we’ve learned about creating a community focused and engaging email newsletter. Sometimes you just need to follow a simple checklist can help you recreate a masterful email. Here are a few quick processes used by marketers. Kim Smith from GoodFirms explains her process for creating engagement. Hamna Amjad from Ridester covers her process in three steps. Come up with catchy and unique subject lines that will give your readers an incentive to click on that specific email right at that instant. Use only one call to action (CTA) that should be clear, authoritative and direct. It’ll likely increase conversion rates if your recipients only have one action to perform. Make sure images have alt text i.e. the alternative text that appears when images aren’t loaded in an email. This is extremely important in the cases where people don’t have images enabled and your CTA is an image. Megan Robinson from @revenue, shares a simple checklist of things that she has used to help create engagement within her newsletters. Test your subject lines. A/B testing is great but also using a subject line filter will ensure you get great opens. Smoking Chili Media’s, Alistair Dodds explains his top four ways for building an engaging newsletter. Personalize each email so it’s clearly written in the first person and speaking directly to the relevant interest segment of our mailing list. Include call outs to users asking what they have read and found useful in the past week. The ones we like we then share through our Social Media channels with thanks to the users Twitter handle so they get exposure and public thanks. Periodically include surveys and competitions to get community feedback. Always reply to any email replies. You might lose subscribers if your email is slow to load, or if your email looks incomplete. Sometimes images don’t always load properly and can create an eyesore of a newsletter. Luana Spinetti a blogger and cartoonist at luanaspinetti.com explains that textual newsletters have a much better load speed. and I write the newsletter in letter format, introducing my reader into the main content with a personal question or a line of emotional impact. If I received enough feedback and requests for specific content, I start with that and only then I add the content related to new content on my website. I add images and videos to the newsletter as the topic demands of additional media, but sparingly, because textual newsletters load faster and get more opens and clicks. I always end the newsletter with a question to stimulate further feedback. Enhancv’s Eric Halsey says plain text newsletters have a better chance at reaching inboxes. This starts with the content. We write resume and career advice, so instead of just hiring freelancers to churn out generic content, we talk to our customers and learn from their experiences. The result is more personal content we feel good about sharing. Besides that, we’ve learned that it helps a lot to send plain text emails as they don’t get marked as spam nearly as much. They also give a more personal feel to the emails. I also encourage people to let me know what resume or career challenges they’re facing and have the emails sent from my actual name and actual work email. This creates a lot of work for me to answer all the questions I get asked after each newsletter, but it’s a good opportunity to engage with and learn from our customers. Project manager Praveen Malik avoids using too many fancy graphics and too long of text to help improve open rates. I keep my newsletters short and personalize them. I use simple conversational language that can be easily understood by a global audience. I avoid using HTML, colors & fancy graphics. I used to design and send attractive templatized newsletters earlier. But my open rate and click rate has drastically improved after moving to smaller textual content. Sometimes you need to switch it up and add a variety of things to look at. Whether that be related (but different) content. Or simply writing about a new theme or topic each time. Aubrey Harper from Kapost explains that you need to showcase related, but a combination of items in your newsletter. Know the difference between related and redundant content. Think about the “related purchases” you see during an online purchase. If putting a bed frame in the cart triggers the shopper to see five slightly different bed frames, they’re only going to click around if they have excessive time. But, if the shopper sees the highest rated mattress, bedding, and matching bedroom furniture, it becomes an exciting shopping journey. The contents of your newsletter must follow the same rule: serve up a variety of content that has a connecting thread but doesn’t exhaust any one topic. Bob Herman of IT Tropolis simply explains that asking for readers to submit content can lead to a variety of intriguing information. I have a button/link for my readers to submit their own tips that I will then send out in a future newsletter. MyCorporation’s Deborah Sweeney explains that readers are not alike, so your content shouldn’t be either. It is important to engage with varied content written in different voices. Readers are not all alike – some like bulleted lists, some like short articles, and some like more depth in content. We try to provide options by presenting different content and articles that connect with readers with divergent interests. We also write content that is relevant and not overly salesy. We feel the services will sell themselves when the content is of interest and readers understand the value of our services. If you’re not nailing it from the getgo, you’ll likely find your emails go unread. But, if you create engagement from the start, you’ll probably have success. Rachel Sielaff from SJC Marketing explains that the biggest thing to be aware of is your subject line as that is what people see first. We keep the content conversational, light and fun. It’s still professional but really highlights our company personality. We also try to keep the text short and link to more information if they want it. Images are also a must, otherwise, it’s just a computer screen filled with overwhelming to look at the text – which nobody wants. The biggest thing to keep in mind – your subject line! It is the first impression you don’t get to make again. It is the deciding factor in whether or not your newsletter gets opened. Our subject line always relates to what’s inside, but it teases it – gives just enough to make you want more. Momentum Digital’s JX Tan says that you can include a direct quote in a subject line to be high-impact. According to Google, an average B2B buyer will engage in 12 searches prior to engaging with your brand. Think about that for a moment: after you have 12 interactions with a brand (including seeing your newsletters), what are the high-impact elements you will remember? If you are honest, emotions play a significant role in B2B procurement decisions. Therefore, our subject lines typically feature quotes from a representative from the target audience, and the subsequent article will present data to provide insights. Another way to engage audiences is through an instant poll at the end of the newsletter. You may wish to include an instant poll to get subscribers to give their inputs to see other subscribers’ inputs. Nate Masterson from Maple Holistics mentions a mysterious subject can be quite engaging and can be the reason someone will click. Surprise people with your subject line. All too often companies fall into the habit of “mailing it in” (pun intended) with their subject which will lead to a lot of deletions and a lack of engagement. Pose a mysterious or ambiguous question in your subject to get the attention of your subscribers and they’ll be sure to click-through. Thrive Internet Marketing Agency’s Amber Ooley explains that using trigger words in the subject line has created engagement for them. I have found that using numbers and words like “tips” in the subject line outperforms others, such as 8 Simple Growth Marketing Hacks. Remember: People are busy. People get a lot of emails, mostly junk. People subscribed to you for a reason. Surveys! This is invaluable to any business with a dedicated subscriber base. Leverage your list to share their thoughts and answers to questions that can ultimately help your business grow and better understand your audience. Consistency. If you aren’t yet sending an email on the same date and time every week, take a look at the data and try to pull any trends. Then, pick a day and a time, and stick with it for a month or two and see if things improve. The magic send time is different for every company but think about your own inbox and your subscribers’ daily routine if you need a place to start. Personalization is key to a lot of things when it comes to marketing, it can make it attractive to the individual and build your customer relationship. So you better believe that it’s just as important when creating a newsletter that resonates well with your community. Ken Collins from TLK Fusion mentions that a bit of personalization makes readers feel like VIP. The newsletter must be designed to address the message to a single individual versus traditional social audience messaging. We approach the audience as a VIP exclusive member that is receiving information or promotions that feel tailored to that individual. We avoid communication that feels overly generic and templated. Futurety’s Elise Telford simply explains that personalization is easy, but helps make the content more appealing. We send dynamic content and use the contact’s first name to increase personalization. Hung Nguyen from Smallpdf explains how getting to know the target is ideal for maximum engagement. –A/B test everything, from sending time to the sender email address to subjects, headlines, CTAs, and visual content. – Unless you know the exact location of your users, you cannot optimize the ‘best sending time’ for each individual user. As such, send emails at different times until you can find the one that yields the most opens and clicks. – If your newsletter is linked and lead users to social media pages, then you can usually find the clues on who your ‘most responsive users‘ are. For Facebook, go to your page, and click Insights > People > People Engaged, which will show where and who your most responsive users are. Prioritize engagement over open rate! Matt McGee from the Cari McGee Real Estate Team discusses how they write to their audience as if they are writing to each reader individually. My wife, Cari, has been in real estate for about 15 years and has a large following on Facebook already, and we know that much of her audience gravitates to her personality. So we always aim to make sure her personality comes through each month — we want every reader to feel like she’s writing specifically for him/her. But we also go out of our way to include a lot of valuable content, not just about real estate but also about neighborhoods and the community — i.e., new restaurants and businesses, road construction and so forth. We do occasionally end our newsletters with questions but have not had success in getting many replies. I suspect most readers are more comfortable having conversations with Cari on Facebook, Instagram, etc. Dawn Gribble from Virtual Solutions explains that simple merge fields can kick up your newsletter and increase reader engagement. Always A/B Test subject lines and send times until you hit that sweet spot, we try to use merge fields in a more conversational style to improve personalization. We reach out to existing subscribers to ask them to contribute, and the newsletter is then promoted across our social media channels, we craft several messages covering each of the topics the newsletter includes. Lisa Chu from Black n Bianco explains that a personalized newsletter feels more genuine and compelling to readers. Always stay away from generic newsletters. You want to personalize the email as much as you can because it needs to feel genuine and try to start off with a compelling opening line. If the email subject looks like spam it will be treated as spam. Instead of focusing on SPECIAL LOW PRICES, try to offer value to your audience. Lose the sales pitch because that will provide you the lowest engagement and conversions. These sales tactics may have been effective 10 years ago. Remember you want to bring value to your audience not annoy them with junk mail. Find ways to pique someone’s interest. If you can manage that, you can create value for your readers. Brandon White who turns ideas into businesses mentions cliff-hangers are his secret weapon for creating curiosity and engagement. When you have links, put them on a separate line. It makes them easy to find and brings attention to them. Be concise, if you ramble you will lose people. Leave cliff-hangers. Start talking about something and tell people the rest of the story or the answer is in the link. People do not like to be left hanging and I’ve found over the many years it creates engagement. Offer actionable information in your content. If people find you are delivering value to them they will continue to read and respond (e.g. click your links) to your emails. Lawnstarter’s Alan LaFrance explains that the content has to be valuable to the reader otherwise there is no point in reading. The content has to hold value to the reader. I know that sounds canned, but you really need to focus on that. Otherwise, you are just wasting everyone’s time. Pull content that is inclusive, transparent, and helps everyone feel involved, and avoid corporate synergy directives that often just seem altruistic or topical. It really needs to resonate and come from the heart. Zach Hendrix from GreenPal suggests that using customer’s logic to pique interests and build value. The biggest mistake we were making with our emails was using company logic as opposed to customer logic. You really need to put yourself in the mind of your customer when crafting your emails. Run your email copy by friends, and strangers, Get feedback because it’s so challenging to get out of your own skin. Then, split your email up int micro conversions. Lily Maley the Director, Creative and Brand for Cision mentions that a clean and valuable newsletter is key. Clear call to action in a bright color, but with a contrast ratio high enough so that it’s super legible and accessible. We don’t oversaturate our newsletters, leaving plenty of white space and breathing room. Our newsletters LOOK clean and well-produced and not like a marketing blast. We tailor content that is VALUABLE to this particular list demographic so that they are engaged and want to keep reading. We don’t just lead with a call to action, we engage it in the fantastic content. Alex Wright from Alex Wright Web Design and SEO says that intriguing CTAs are a way to get the conversation to happen. For engagement, include content that has been vetted on other services. For community creation, try to have at least one of the Calls To Action in each email encourage a blog comment. That way, a conversation is happening that the email recipient can engage with. PayKings’ Jessyka Lee discusses how discussing trending topics and offering solutions for those topics create great value, thus leading to engagement. We highlight new partners that we’ve taken on and promoted their business through writing a short piece on what they do and how they can serve our audience. Additionally, we take into account the latest trends and “news” in the industry. Say, for example, there are new regulations in the vape or CBD industry, we would share that information in our newsletter and offer solutions to those retailers who may be facing being shut down for payment processing. We make sure to always stay relevant and remind our audience that they have a need for our services, how and why we can best help their business grow into their full potential. A call to action is always necessary and including links for readers to follow us on our social outlets are always included. Your subject line is the introduction to the rest of your email. You have the whole message to get your point across and tie back to your subject line. If you can accomplish this, you likely have an intriguing email. Sumit Bansal from Trump Excelshares a couple of tricks for getting more clicks on newsletters. 1. Have multiple links: If I have a newsletter that is 500 words long, I make sure there are 2-3 links to the same article/tutorial. Some people decide they want to read the tutorial by reading the subject line, and they usually click on the link that I provide in the first 2 lines. Some people need more context and for them, I keep a link at the bottom of the newsletter. 2. Send again to people who didn’t open: No matter how great my email is, some people are not going to open it the first time. It could be because they are busy, or driving, or decide to read it later. I send the same newsletter with a different headline two days after the first newsletter. This gets me a lot of extra visits to my site which I would have missed had I not sent this again. James Nuttall from Cuuver explains that getting your point across can be accomplished by focusing on a primary CTA. While it is okay to use several call to actions in a newsletter, you should focus on one primary CTA, to get the readers to view the same page. This CTA should link to something that is relevant to the contents of your newsletter, whether this is a product page, a forum or a blog. This will guide your readers to the same thing and encourage them to interact with one particular aspect of your website. Offering exclusive content also attracts users to engage with your newsletters. For example, an e-commerce site could include a link to an exclusive discount page, only available to those who have the link, where customers can get 20% off. IMP Corporation’s Vincent Scatena says that using brag-worthy content can reinforce your brand. Over the past decade, I’ve seen reliable increases in CTA interaction when the above-the-fold of a newsletter contains recent company or product bragging rights. In B2C, it could be showing your new shoes being worn by some celeb, or in the B2B world, it could be some major recent project. The bottom line: floating a little soft-brag to your readers will reinforce your entire brand and their likelihood of converting increases. People read newsletters because they are interested in what you have to say. You can make this more enjoyable for them if your message lays out as a story or some sort of narrative rather than a series of tiny topics with no relatable connection. Jonathan Alonso from CNC Machines says a story that is both humorous and serious can be exactly what readers want. Try out 2 main things, First always A/B test your Email Subject, this is the doorway to your messages, 2nd, Add a story they can relate too. Just adding content will not work. A great email that I have seen and I use as an example is “Hustle.Co”, They use a story with a comedic but also a serious edge to attract entrepreneurs. Ben Lauderdale from Shinesty explains that you can go beyond your own experience and share that of customers to increase engagement. Invoke comments and voices from your other channel communities. Some of the highest converting emails incorporate customer endorsements and quotes from those who’ve seen an ad we’ve run on another channel. We tend to use follower comments as third-party endorsements to support the stance you took at the very beginning of the newsletter. By showing one community how another community is engaging with your product, you can craft a newsletter that entices readers, shows what others think about the product you’re promoting, while also hinting that they’re missing out on another communities conversation. Derek Christian from Handyman Connection talks about using something fun like giving out a prize to increase engagement. We have a game or contest in each newsletter with a small prize for the winner to drive engagement. Lauren Petermeyer from 301 Digital Media mentions that offering something unique can prompt people to engage with your newsletter. Ask questions and give people a reason to click. Prompt them to learn more and offer something unique that the reader may not already have. Anyone can send out a newsletter about anything, so it’s important to identify your purpose and give the reader a solid reason to keep coming back. Pinstripe Marketing’s Nikki Devereux says that they amp up their stories newsletter by using a fun theme to make it more interesting. We always give great marketing and PR tips in our stories so that our readers can come away with actionable items to improve their business. This year we started a Wonder Woman and Marketing series, which people have really loved. We are always thinking of ways to make our articles about marketing a little more interesting, like doing book reviews for something a little different or creating a themed series so people are looking forward to the next story in the series. We also highlight local events and our clients with interview-style Q&A stories that give readers a more in-depth view of the people with whom we work. Sometimes a good email needs a little something extra to get people to engage. A CTA or a simple question can do the trick. Shannon Howard from Overit explains that asking a question is a great way to encourage reader engagement. Asking questions is a really powerful way to create engagement. Including visual and video content is also a great way to create engagement with your community. Blueliner’s Soribel Fernandez mentions that a good debate and asking questions can be exactly what you need for creating engagement. Ask a question, generate a debate, ask for feedback and comment back. Victor Bilandzic from Motava simply creates engagement by offering a gift to those who email back questions. We’ve offered gift cards for subscribers to reply to our email with questions about the industry. That was a hit. Then when they were selected, we sent them personal emails asking them to share with their colleagues/social media. Liz Coffman from Riotly Social Media mentions that doing customer interviews has been a great way for creating an engaging newsletter. 1. Include visuals. As I said above, images not only keep a reader engaged while they read, they are great for creating visual targets for the links you are promoting. 2. Know who your audience is. An effective and compelling tone of voice is going to differ based on your target market. 3. When it comes to creating a sense of community, I like to occasionally use quotes from some of our current customers to tie together the content. 5. The best thing I ever did to develop a strategy for creating an engaging newsletter was to interview my company’s customers. The best way to deliver content your readers will engage with is to ask them directly what they want. If you use the feedback from your subscribers you can create a newsletter designed to fit exactly what they want. Making your newsletter something people want to read. Ketan Kapoor from Mettl explains that implementing feedback is a big factor in creating future engaging newsletters. The approach might vary depending on the type of audience, whether it’s B2C or B2B. In B2C, a series of campaigns that run contests can be a starting point. Moreover, you must always ask for a feedback and show the implementation of the feedback in follow-up emails. When you convince customers that you take feedback seriously and are on top of your toes to implement the same, it can kickstart engagement straightaway that continues to snowball. Lucky draws and freebies are another approach you can rely on to create meaningful B2C campaigns. In B2B campaigns, nothing works better than personalization and relevant follow-ups. Owing to the high ticket size in B2B, prospects don’t want to be bombarded with generic emails that can kill their interest. Rather, you must keep the message short, sweet and specific to their problem; if you are to pique their interest and attention. Next, you must have a cross-channel approach to tap leads and convert them into paying customers. For instance, if someone became a lead via email; you must also keep an eye on other channels such as social media and chat to cater to their interests better and in a timely manner. Then, in B2B, you must always tie a product line to a prospect without which you can’t nurture them successfully. Capture their initial interest, tie it back to a product line and send only relevant emails to the person in the future. The Advisor Coach, James Pollard, says encouraging subscribers to reply to your newsletter is a great relationship builder. I continuously split-test my subject lines so I’m always improving my open rates. Also, I encourage my email subscribers to reply back with any questions. I take great pride in building a relationship with my subscribers. I believe if you aren’t trying to build a relationship with your following, you shouldn’t be doing an email newsletter. Rob Powell from Rob Powell Biz Blog mentions that asking what subscribers are interested in helps personalize his newsletters. I ask my readers what topics they would like me to write about. Periodically, I also survey my readers and ask them what’s the #1 issue that they are struggling with in their blogging business. I use a personalization tag (first name) in the salutation to improve engagement and open rates. Fundera’s Nicolas Straut explains that there isn’t a perfect science per se, but asking for feedback can help you tailor an engaging newsletter all around. Creating a great newsletter for your industry and audience isn’t a perfect science and you shouldn’t be afraid of making subtle experiments with design, content, and format to increase engagement and keep subscribers interested. Some newsletters turn off their subscribers by plugging their offerings too much and appearing too salesy. You can avoid this by scheduling special offers each quarter for inclusion in your newsletter but not making it the focal point of the email. To develop great community with your email newsletter community, ask for feedback through email or social media at the end of each email, and consider sending out a simple survey twice a year to gather feedback. Some companies also create Facebook groups specifically for newsletter subscribers to share feedback, ask questions and connect with other subscribers. Devin Stagg from Pupford mentions that having a private social media community has provided them with a ton of great feedback for new content ideas. Creating a private Facebook community has been a huge way we’ve been able to create a true community around our newsletter. This community gives us feedback on blogs we write and gives us about 75% of our new content ideas! Listen to what people are asking you and take notice of what they are interested in. As you can tell, most marketers can agree that those two little things can help you create a pretty engaging and read-worthy newsletter. Thanks again to all those who have contributed! If you’d like to contribute to upcoming roundups please visit our content partnership page.